Space History Photo: Astronaut John Swigert with "Mailbox"
Astronaut John Swigert holds the rigged arrangement used to purge carbon dioxide from the Lunar Module during the Apollo 13 mission in April of 1970. In this historical photo from the U.S. space agency, Astronaut John L. Swigert, Jr., Apollo 13 Command Module Pilot, holds the "mailbox" a jerry-rigged arrangement which the Apollo 13 astronauts built to use the Command Module lithium hydroxide canisters to purge carbon dioxide from the Lunar Module in April of 1970. Lithium hydroxide is used to scrub CO2 from the spacecraft atmosphere. 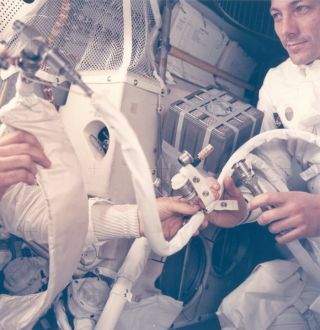 Since there was a limited amount of lithium hydroxide in the Lunar Module, this arrangement was rigged up using the canisters from the Command Module. The "mailbox" was designed and tested on the ground at the Manned Spacecraft Center before it was suggested to the problem-plagued Apollo 13 crewmen. Because of the explosion of an oxygen tank in the Service Module, the three astronauts had to use the Lunar Module as a "lifeboat."